Happy New Years, and have a wonderful fishing day. I'm committed to doing family things today. No fishing for this girl.... but I honestly hope that all of you catch your dream fish this year! Best of luck..... and I hope you all have a wonderful New Year...full of love, and hope, and peace. Is it Christmas yet? I have a wish list prepared! Oops! I think I am a little late/early? I need a new computer to handle all the equipment that Ifish needs to handle all the stuff.... just Stuff! I need a computer techie to help me figure out discussion board and other woes. That is all! Then I'll be all better. Seriously, if you know anyone that fishes and likes Ifish that would like to help iron out some discussion board/CGI stuff, let me know! And.... If anyone has a spare computer,.... Hey! This is not a help wanted column.... I know.I'm sorry! I am just feeling the New Years crunch to keep up and current! I want to fish girls and boys!!!! Have a great fish on kind of day! The Wilson has been OK.. Haven't had a good report.. Seriously out of touch these last few days and for that I sincerely apologize.... but the Discussion Board is so good! Keep up the good work, and I thank you all for participating! Let's see...... where to start! Stan wrote a column that is near and dear to my heart....Posted Here. My aging lab is laying on the couch. My dog Hershey is so wonderful.... Iv had him for 16 years. He doesn't get around as much, but still when I go fishing he is there, wagging his tale at the first sight of me with a rod in my hand... Heading out the back door....He acts like a pup again, if not briefly, until he tires out, and goes back up to the house for a nap. He does stay out a while, and does really well for his age. But oh, the turmoil that mounts in me when I appreciate the love and affection Bill's dog, Dee Dee shows me. Hershey won't climb the stairs to visit me when I retire. He prefers his pillow by the fire. Bill's dog jumps up in my lap, (All 86 pounds of him!) wagging his tail.... falls asleep with her head on my leg as I stroke her softly, and begs for affection like Hershey used to. I have to say that I do love that! Dee Dee has the enthusiasm and energy that Hershey used to. But sometimes Hershey will give me a sideways knowing glance, while I have this big dog in my lap, and my heart just drops to the floor. I feel like he is crying. I feel like crying. Hershey can't hear anymore... He has cataracts on his eyes, he just needs a lot of rest, and although I know he loves my attention, he just doesn't have the energy to pursue it. So I visit him on his bed... I lay by him, and remember all of our memories...I pet him gently, and comb him and hope to God I don't fall apart when he goes. But he will go..... and I will be left with more than 15 years of the kind of blessing that is very rare and special. God help me to be Thankful.... instead of broken. But oh, the turmoil that mounts in me when I appreciate the love and affection Bill's dog, Dee Dee shows me. Hershey won't climb the stairs to visit me when I retire. So, so, so much going on! HELP! I'm getting way behind! Tillamook Bait Company to Ifish! I have been talking with Marie.... Even bought some of her gorgeous eggs! Wow! In jars, just like Mommy used to make! They are really nice....Tillamook Bait does shuttles, refers some neat guides, and gives fishing reports if you call them! They will also be doing occasional reports here on the web. Did a nice drive down to three rivers yesterday, and the river was really pretty. I have never fished there before, and lost lots of rigs at the hatchery hole. Went over to the hatchery and watched about 100 smaller steelhead in a small, 12 foot area or so, try to fight there way up the riffles. Wow! I am always so amazed at their work ethic! I thought I worked hard! Not! Talk about focused! They were all clogged up in there getting totally beaten up with no sense to just give up and swim in calmer waters like I have done in my life! The Kilchis is beautiful today! I fished it with Contest Winner, "Bill Madden" of Intel this morning. What a nice guy! Bill Hedlund, (Let me be specific on Bill's here......) took us down, and I got out due to the chills and a sore throat out in front of the house. Actually I got out a little selfishly, and quickly got to a good hole before them..... Lost my rig first cast. Serves me right! So now I am toasty warm by the heater, a thermometer in my mouth and Alka Seltzer cold medicine by my side. They are going to do the rest of the river...(Annnnnnnd now..... for the REST of the river........) I sure hope they do well. The water is absolutely perfect! The weather is good also.. I took some digital pics with my borrowed digital cam, and hope to post them real soon! Anyway..... best to all of you.. and tons of big silvery fish! This is Bill, sitting in for Jennie this afternoon. Jennie is feeling sad and low because of an accident a bit earlier. She hooked a chromer steelie, played it well up to the bank----pop goes the leader! This is the first one she has lost this season, and apparently has forgotten that losing fish is part of this ballgame. She'll be O.K. The Kilchis is still in nice shape today because very little rain has fallen in the last day. Until the hard rains hit us, it looks like all the rivers will fish tomorrow except the Necanicum may be on the low side. We are nearing the peak of the hatchery steelhead runs so there are lots of fish scattered through out the systems. Now is the time to fish every day you can get away river conditions allowing. Pressure has been surprisingly light this week from our observations. Get on out there and catch them! I fell asleep last night at 8 oclock, the light on, the TV still going... I was so tired that even though I woke up through out the night, I didn't have enough energy to turn everything off. I have had SO many computer problems; cant connect to my server, trying to install and configure the Davis weather station, trying to figure out diplomatic issues on Ifish, that I needed a long winters nap. I got it! I wonder though, what is wrong with Pacifier. I connect for about 1 minute and then it shuts me down. I hooked and landed a spawner on Saturday. It was a lot of fun. She was about 10 lbs. I'v been losing so many rigs that I decided to tie up a bunch of rigs and take them with me. Then Sunday the river blew out. I wonder the color today. 0.45 inches of rain last night. Hmmmmmm. I have my weather station hooked up and it clears every night at 6:P.M. So the rainfall is since 6. I will give you a sneak peak at the unfinished product. Can't get the images to load and I was going to wait for perfection, but here it is for now. Notice it hasn't uploaded correctly since yesterday! Thus, a call to Davis this morning is in order. Well, off to get the boys ready for school, and a day at the mercy of my computer....The dog wants in too! Will the rivers be out of shape all week? I don't know! Maybe I'll just hope for one little bit of plunkable water??? Have a great day, everyone.... I'll be thinking fish!!!!!! I just LOVE the snow! I needed this! I know, I know, it's hard to drive in, but it is SO gorgeous out here! The dawn is slowly showing that...YES! The meadow is covered! Great huge, silent snowflakes are hesitantly dropping from the sky. So slowly, like they are searching for the right place to land, to cover the ground in completeness! I'm sorry, I just can't write about fishing.... (where are the sleds, kids?) The sky is bright white.... it Looks like snow..... It tastes like snow... IT IS SNOW! I talked to Stan Fagerstrom on the phone last night, and darnit, if he didn't talk like snow was in the forecast, and darnit, if I couldn't sleep wondering if I would wake up to it, and darnit, if I didn't wake up at 5 and hear that silence. The silence that is snow in the country! Jennie is happy. Jennie is a goofball! Jennie wants to go get the kids from school and play!!!!! Hey, I'v settled down now. I even fished for a bit in that freezing gluck. My, how attitudes change when great big globs of snow fall down your neck from the trees! Anyway, I updated Marie's page from Tillamook Bait, and Stan sent me a new column! Hey! COOL! Stan talks about anglers traveling by air, which I thought was very interesting, and gave me some ideas of what NOT to do! Man, how terrible to have the airlines ruin your tackle! I would be LIVID! Anyway, the snow is just gorgeous, and to prove it, I took some pics... Here they are! This is a big pic with lots of K, so be patient if you really want to see it.. Anyway.. The snow is still pretty, and I still love it, just from the warmth of my fire..! Bye! A nice cold drink.... Thats what I need. Long day! Bill and I packed the rods in the car to head North to do some errands... But, we were planning on fishing the Necanicum. NO LUCK! We simply did not have time, (dreamers that we are.) The Necanicum did look really nice though, as did the Kilchis this morning. Too bad we couldn't get our lines wet. At least we don't have to go for haircuts and grocery shopping on Saturday Morning though. We'll be Fishing~! Tomorrow we plan to fish, not sure where or when, but darnit.... we have to! Rainfall here, as you can check the weather station.....(Which by the way is permanently linked on top this column, for future reference.) was not heavy today. Forecast calls for heavy showers, but then again who trusts the weather man? I trust what the past shows, not the future predictions. P.S. we have had 11.01 inches this month alone! Wow! Wet yet? Have a great day, or night, as the case may be.... I'm darn ready to catch a fish tomorrow.... how about you? Imagine for a moment telling your arm to pick up a cup of coffee and it just sat there. You pull at it. You will it to move even an inch and it remains still. There is a lady that is very deeply and dearly loved that is on my mind today. A lady who I have admired ever since the day I met her on a cold rainy Nehalem river morning. She was out painting an old wagon. She had turned trash into treasure, and her pride in it was evident. The joy in life showed in her every movement. In her garden, in the hundreds of birds in the yard. She proved in her every endeavor that it was a home in which she took the time and effort to love and care for every human and creature near her. Her kitchen was warm and inviting and always smelled of the things Grandmas houses smell of. A warm fire always in the stove, good food in the oven, prize winning photos that she had captured of natures beauty, hundreds of ribbons from County and State fairs. 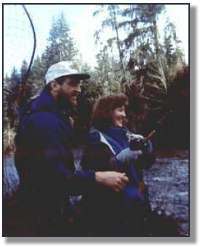 I have in my mind a picture of Loretta helping Jim into his waders so he could go out fishing. She made sure he had enough coats to be warm. It was endearing to see such a tough fisherman receive that kind of attention. The picture stands firm in my memory. Thats what I want someday.... To love and care for a man so much as to do these kinds of every day loving gestures throughout a lifetime. To be so dedicated to the ones you love that these kind of things come naturally and easy. Loretta Erickson just plain loves people and life. Loretta had a stroke two days ago and is in the hospital. I went to see her and still she joked.."Jim says now I can fish at the handicap ramp!" Please keep Loretta and her family in your hearts and prayers. I didn't fish at all this week? How bizarre! Yesterday I was all ready when my son broke his braces... Off to Astoria once again..
High winds expected Sunday. Really high winds..85mph... At least that is what is predicted. That makes me nervous, because my sons are going to their Dads house in Astoria. I want them near me! I am off to the ODFW Anglers Education Program to learn how to teach all kinds of neat things to the area youth. Sounds like fun! The Kilchis is beautiful this morning. Better fish today while the storm is at bay! I have to transfer the entire weather station over to Bills computer this weekend sometime, so expect some weird readings.... No fun! I also got a handle on how to fix the discussion boards weird date and some of the posting glitches. Yet another expense for ifish... YIKES! My piggy bank is running dry! Well, off to the showers. Hope the wind doesn't Getcha! We were right! Yesterday evening after the ODFW Anglers Education School, we dropped by Tillamook Bait and got some shrimp..... JUST incase the windstorm didn't hit till later! It isn't supposed to hit till around 11 now! The Anglers Ed was excellent, and hopefully we will have pictures soon. What a great day of fun fishing games and lots of discussion on ethics, etc. I met Steve Hanson last night. Hi Steve! He dropped by after fishing the Kilchis, and we were in the middle of Wood Stove burning troubles. Had the stove cleaned yesterday, and it wouldn't burn, so last night was a late one with the Chimney Sweep guy out here trouble shooting. Nice guy, and we do have a stove to burn now if the wind blows too hard. I am going to go shower and hit the river before the storm hits.... Wish me luck! Yesterday Bill went out briefly, and when he came in I asked him if he had any bites. "yip, one" he said...On the way out the door, later, he pointed inside the boat and said.."See, there is my bite...." and there lay a beautiful hen! What a tease! Now I'm going to get my bite! Good luck to all in the storm. 90 MPH winds forecast. Stay inside! Build a fire! Snuggle with someone you love. I knew it couldn't last. I was afraid it would! I was afraid that Bill would eventually call me "bad luck", the way he calls a certain pair of jeans "good luck" if he catches fish in them. Bill is catching fish again. The way he always did. He simply can't miss! Fish on! I hear it day after day! Go BILLLLL! I loved yesterday... We went up the other side of the river, past the park. We were going to go way up, but gosh, the road was gone! A section of about 20 feet of pavement disappeared in front of us! It was blocked by a downed tree and some red tape, but it was really spooky! A great big section slid into the river below. A canyon was created by it that was probably 25 feet deep. We grabbed our gear right there, and hiked down to the river. It was absolutely gorgeous! A totally untouched feeling, although there was a little bit of garbage from earlier visitors. How sad! Don't put too much oil in your reel before going on a trip. Even a short trip. My day was kind of challenged by too much oil and it was very difficult to cast. Bummer! Good thing that it was so beautiful there that I didn't mind, and just kind of stared in awe at the beauty. The sun was brilliant and the scenery indescribable! I went home and flushed the reel with hot water.... It worked wonders and I hit the river below the house. It is really low and clear, so black bottomed bobbers and light lines are a good choice. I have a personality conflict with my body. I love to hike into remote places to fish. You know, those "fanny falls" kind of places where you need to just sit down and slide, and worry about how you are going to get back up later? I'v been known to pack the fish out by wrapping several loops of line into a purse and slinging the fish over my shoulder! Lately though my body doesn't want to do that and I do! Brings me back to how Loretta must feel about her body not obeying her mind when she tells her arm to move! FEH! It drives me crazy! My legs, when I try to walk over rocks want to twist in ways they aren't suppose to! Sometimes I will be walking along and PHT! I'm down! How embarrassing! The frustrating part is that they are just fine, and then go with no notice! It is all part of the connective tissue problem I was born with. So, if you see me sprawled out on the rocks, leave me there...look the other way, PLEASE! It is good long distance casting practice! The Wilson is hot this week, and I am not! The Kilchis is low and clear.... Very clear! I want to learn how to fish the 'low clears'! But Gosh, if I can't see um, and I can see the entire bottom of the river.. Are they really there? They have GOT to be! I want um! Off to work and fish, fish and work, work and fish.... fish and work! Bye! I decided not to go on the Wilson with Bill and his friend today, in favor of staying home and fishing the Kilchis. The Kilchis is beautiful today. I fished for a little bit, caught a beautiful cutthroat by accident, and let him go. I look out at how beautiful it is here, the trees, the open sky, the meadow. The river plays music to me as I sleep, and when I wake, and when all things are quiet and hushed. Life is so changeable. Sometimes all I want is for the seasons to not change. Although I love them all, I get stuck in loving the one I am experiencing, and hate to see the next one come, or the last one go. As I look outside today, though, I see bleak skies. I am worrying about my future. I see gray. I am pondering my fate. I see rain. I cry. Will I stay here in this house that is made of dreams? Is this where I belong? Have I done something to deserve this paradise? There are problems adjusting for everyone here. Life is an adjustment.. day to day to day. My heart is aching today. I feel as lost as the winds that swirl with no direction around this canyon. I feel as hopeless as a girl who fished the entire stretch of a river and did not find what she was looking for. The more I think about it, the more I realize that God has placed rules in our lives, not because he is a big, strict, awesome disciplinarian, but because he loves us, and wants us not to be hurt. Seasons change, no matter where we are placed, where we land, what we do. Season after season after season. It's going to be a crowded weekend on the rivers! The Necanicum and Kilchis are running high and green but on the rise slightly. If rainfall after 6 P. M. till tomorrow morning is not over 1/2 inch, both will fish beautifully! --30+ ?? Most boats had a fish or so in spite of rising waters today. I put in a good decent day of work, came home, worked on the weather station for a while... (Like it? ), grabbed my Loomis and headed out for the crick. (that looks funny in print!) Anyway, fished it for a while, did the usual. Got a bite! Then Bill casts, and catches it! You don't know HOW many times this occurs! I actually got a little sulky this time! A bright beautiful wild steelhead, still with sea lice. That means 36 hours from the sea, right? (preface: sick humor follows...) So, we conked it over the head, dragged it up the rocks, gutted it, took out the eggs, and gave the meat to the gulls. NOT! Please don't take my sick and sullen humor seriously. It's not even funny, right? I knew it wasn't! Bill is an expert at releasing them so that I'm not even sure they know they are hooked! The man loves his wild fish. But I am serious about the smile and hopes in my heart for fishing the Wilson tomorrow. I can't wait! I really can't! I have these high, 'pie in the sky' hopes for a beautiful day on the river. I just love seeing how beautiful the water is, and seeing folks we know, and watching everyone catch fish. I want to catch one too! I have learned that if you start that competitive thing, (like I am starting with Bill!) things turn out for the worse. No way could I outfish Bill... but I do like to catch fish! He is ahead of me! Oh well.. I still catch 'em, and after all, I am ONLY a girl! Why can't I be serious tonight? Cuz I want da fish and I lose da fish! The rivers are dropping. The Kilchis is running fairly clear. The Wilson is not dropping as fast as I thought it would, according to the graph. Good luck out there.. If you are on the Wilson, I will be the girl with the big fish! I am licking my wounds again. Bill did it again! Caught my fish! (Hey, RT., he loves the plug!...Did you give that to me or to Bill?!?) Anyway, the plug caught the fish, not Bill, right? What a cold miserable, east wind howling, freezing rain blowing sideways, finger numbing, WONDERFUL day on the river! It was fun! Received some disheartening news today. A reader wrote in about fishing the opposite side of the hatchery on the N.F. Nehalem, which he has been fishing for 25 years. When he came back from fishing, his rear window was broken and his rig had been broken into. He had a bunch of gear stolen. So, you go to a familiar place that you find beautiful and untouched.. It becomes somehow yours. You feel you know each and every trail, tree, downed log, etc on the way to the hole. You feel safe there. You feel like it is 'your escape from everyday life. You have always met friendly people there, and have no reason to associate it with negative feelings. So you put in your time at your hole, fish or no fish, you feel good just being out. What an assault to find this kind of vandalism! It not only affects your material loss, invades your personal space, but add to that the loss of feeling safe there! Plus, another reason to feel negative towards the world. Just what we don't need. This kind of thing drives me absolutely nutty because I like to think the best of people and sometimes I feel like my innocent outlook on the world is becoming more tainted. Yuck! I don't want that to happen! So you big, bad, ugly guys who ruin it..... GO AWAY!!! Have fun....... rain coming this week.. My thought is water going up??? or staying nice???? These and other questions remain a fishing mystery! anticipation of the rapids, the Jack, the King, the Queen. Will we be all right? waiting for the next hole... River stress! Before I got an answer I would throw it to where I thought looked best. Most often I did right, and sure enough! FISH ON!!!!! "You may get a little wet!" Wet, Jim? died, my cat died, and all 12 of my chickens died. I kid you not, this is all within 2 months! Anyway, I was dirt poor, and I got a windfall of money I didn't expect. I took 100 of that money and did something for myself that was terribly frivolous. I needed it! I had never drifted a river, and by golly I wanted to BADLY! So, I looked in STS, and found Milton Fisher, guide on the NF., and I arranged for a trip. The rest is history. I got to know the gang on the Nehalem. But that trip, the very first trip with Milton was like nothing I had ever experienced! What a treat! It is SO gorgeous, and so unlike anything I had experienced as a bank angler. So.... the NF is special to me, and I get to go tomorrow! Big guys on the Nehalem today! Bill Monroe, Jim Martin, Rick Metsger, Jim Erickson, Paul McCracken... John Krauthoefer... fun! We all went down in rafts from different points, covered the whole dang river! I caught a recycled fish, and released it. Fun though! It is unbelievable to catch a fish right in front of you, where you can see the bottom! Bill had four fish on, Jim Martin had four. John rowed the boat. They put in at the hatchery at daylight, and started down. Bill Monroe (the great . "doubting Thomas"... the typical republican... "you gotta show me to believe it"), floated along, and on his first cast in the 30 dollar hole Bill's riggin' moved about 10 feet--- had his first fish on a jig! So much for not being able to catch fish in crystal clear water! Down the river they went....Bill hooked 2 more fish in the first two miles. Jim Martin (Chief of Fisheries, now retired), another doubting Thomas, had four hookups in the same two mile stretch. From there, they drifted casually to Ericksons where they shuttled their rigs and went on down the lower river. Now they were following Senator Rick Metsger and Commissioner Paul McCracken, who also had just lost two-10 pound chromers at Ericksons. They continued on down the lower river, in previously fished waters, and angled to no avail. They pulled out and headed back to Ericksons for coffee and B.S. *Fishing is only going to get better as the rivers drop and get clearer! Don't give up! Just change your methods and get um! Need info? Call Jim Erickson, at 1 503 368 5365!!!! I'v spent so much time on the computer today that I think I am becoming one with the screen. OMMMMMMM. Introducing a new page with Pics from Steve Hanson... That's right folks, it is R.T. totally, and visually revealed.... and you saw it here on IFISH! I worked on Tillamook Bait Co's very own brand new domain. Got crazy designing some fish backgrounds for them!Now I will go to sleep dreaming little fish all over! Marie and Dennis will soon have a discussion board that they run featuring yet more reports on river conditions! How lucky can we be? I am really very excited about it all! Anyway..... no fish for this girl today. I didn't even get outside as much as I would have liked. Twice during the day I glanced out at our meadow with the sun pouring down, and saw myself running with abandon with the dogs, or playing Frisbee, or riding a horse through it... but no, I stayed put, got a whole bunch of work done, and now it's time for basketball practice for my youngest. Make sure you go check out Steve, and there will be a permanent link under the discussion board link on the right, just in case you lose this one! First things first, the good.... I am SO excited! Bill and I got the chimney guy to put the anemometer on the top of the chimney! So now we have REAL wind speeds! Except for the fact that we live in a canyon and they swirl around down here like mad. Hope it is in a good place. I sat and stared at it for quite some time.... 1 mph... 2 mph..... It was really entertaining... Yaha. So, we're getting things done like mad...we got the chicken cage all cleaned out of garbage and ready to disinfect and get baby chickens. Now this is something that I absolutely can't wait for. This is the girl that thought the highlight of her day was gathering eggs about 10 years ago. I did! I loved it! Couldn't wait to get out of bed in the morning for the egg hunt! I had a baby banty named Robin, and I loved her so much! This cage is going to be racoon proof to the max! Last one I built they got in, and one by one, no matter how much work I did to make it a fortress, they all got killed. Not this time! We are talking bomb shelter! Oh! And I was carrying out some tin sheets, and under one was a huge rat and it crawled over my hand! Bill got out his gun and we went hunting for it. No luck! So then.... It's dinner..... every one is calm and looking forward to halibut fish and chips... (MMMM!) and we get the dogs food ready first, right? So Hershey, who usually won't eat unless you call the kitty to threaten him, gobbled his down.... and Dee Dee... the ravenous, food loving dog that eats anything.... well.... she wouldn't move off the couch! I mean, listless, no interest..... My heart sank. We knew it would happen. Living on a river you just have to expect a dog to get salmon poisoning. We foresaw this event before we moved and have the pills on hand. But still..... I would appreciate prayers for Dee Dee.. She looks like she wants to try her best to just die. Hershey and I lived along the Salmon River in Otis, and he has had it twice. So he is a connoisseur of rotten salmon. He eats it all the time and is fine. I have had two dogs die of it when I was young. I remember it being awful. I am nervous. Poor sweet dog. The vet sounds optimistic we caught it in time. Let's just hope. I am off to play in Astoria tomorrow, and that is not what I want to do. I don't want to leave this dogs side. I remember one time I had a dog, a puppy.. and he caught parvo, before it was a very common thing.... and I stayed up for nights nursing this dog. I fell asleep finally one night, and when I woke up.... you guessed it, he was gone. Now I need to be right there..... all the time! I have to! I can't!!!!! Bill will be here with Dee Dee. It will be all right.. it will be all right. Oh! By the way! I put up a discussion board for Tillamook bait's site! Cool! Pro guide David Johnson called in a reports from last weeks Wilson river fishing.Tues: Hooked 8 landed 6 with tow natives.Wed: Hooked 8 landed 3. 1 runback, 1 brood and 1 native. Anyway, Len Self writes in to remind you all of the rally in Portland on Feb 3rd. I would imagine all of you know about it. But if not, please write to Len Self for more information. All anglers with boats and trailers are urgently requested to attend! Dee Dee seems to be doing well. Seems we caught the bug, or fluke, whatever.... in time! YAY! The rain is coming and I think so too, will the fish! I'v got a horrendous week of doctor appointments this week, along with trying to schedule all of the Northwest Steelheaders knowledgeable about river access issues into the Sportsmens show. How did I get the job? I don't know! But I am learning a lot in the process, such as how to raise my phone bill in 300 easy steps. No, it really is kind of fun to talk with all these folks, and the Sportsmens show will be a blast! Off for today. Enjoy the low clears for the day, and think higher water for later! There is a high wind watch out, so try and check on my new anemometer location at the Kilchis Weather Station! Wheeeee!